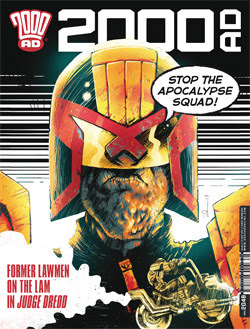 The war buds continue their escape and it’s interesting to see Dredd second guessing himself. He does have his doubts about his decision to euthanize, but in the end he does – sort of – return to type. There is a little leniency there, which makes the ending interesting! I liked the flashbacks to his dealings with the previous Chief Judge who has begun to loose her faculties! The Alienist looks to be enacting their plan, and it’s quite an action packed prog. The battle is well done, with a further look at the background and origins of our cast! The more gruesome parts are really well done, with some nice scenes too! I wonder where this is all going to lead though, as it looks like the plan has taken a dark turn! Blake’s plan moves on and he gets a nice measure of revenge here, not as ‘nice’ an end for one as his victim has been left alive, although not much good to anyone! It looks like we’re gearing up for some action in the next issue as the battle is less of a secret! I like the reaction to the various rooms getting blown up too! A nice Future Shock here, as I thought I knew the ending, but it turned out that others did too! The finish was quite satisfying in a way, and I liked the twist on the twist at the end! Hope gives us a nice end-of-investigation explanation – with the full story and reasons behind the murder of the child star. Although there is magic in this world, this is a down to earth reason for murder, something very simple, but with the magic in the background. What happens next though is anyone’s guess!